On what looked like a perfect day to go road cruising, way back in December of 2004, Parisian painter Chris Balzac resumed his Goa trip with his girlfriend on his Royal Enfield. But the tsunami hit the coastline later that day. Balzac was stuck in a fishing village in North Goa. The havoc it caused in its wake had broken the painter's heart. He did what he could do to escape the pain: painted the bike and the helmet. He had company in Babu, a painter from Rajasthan. Balzac visited Babu three years later for a project, which inspired him to launch the first Indo-French luxury brand of helmets -- Goa Chic. It is the only brand that has homologation -- registration of eligibility for international racing -- for hand-painted hel- mets in the world. They will be on display for the first time at The Art of Motorcycling, an exhibition conducted by W+K Exp in col- laboration with Royal Enfield. Not sure if Balzac, also a musician, found in the rhythmic Enfield thump a B e e t h ove n's symphony. But he had surely found inspiration for his helmet art to go his idol Andy Warhol's way -- with series production of art pieces. A backpacker at heart, no wonder Balzac has chosen an exhibition inspired by the cult bike to showcase his work. The exhibition will showcase, among other things, many photographs shot by Bharat Sikka for Wieden+Kennedy's ad campaign for the bike. "A lot of people asked for signed copies of the photographs. We've been planning this for sometime now," says V. Sunil, executive creative director. "Since it's Royal Enfield, we treat it like art. The photographs were shot in real environments with real people. They are not ad-like." In addition, there will be digital art created by Prasad Raghavan. Most of the things on display will be up for sale. There will also be limited edition T- shirts, merchandise and over 30 cus- tomised bikes. The fans could also test ride some of these bikes. In a first, the master painters Kishore Kumar and his brother, would be demonstrating their skills on visitor's bikes. 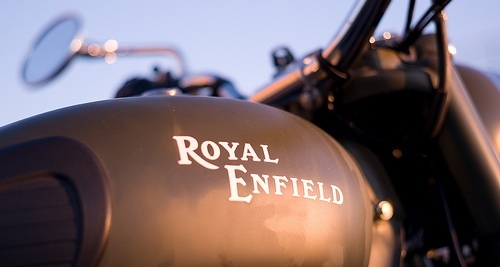 The tank of each Royal Enfield, the original black model, that comes out of the Chennai factory is handpainted by them. "It's not serious art. If not for Enfield, we wouldn't have dared to call it art," says Sunil. i appreciate your work , nice work man !!!!!! !